Helping to "support" The Bra Show, this weekend! This Saturday at Bjava Coffee, Tea and Art Gallery, Live Lovely Music!! First Bra for art show. Artist, Judy Leiviska, dropped off the first bra for the next art show. The June art show is called "Baring the Truth". This is an exhibit about breast cancer awareness. Please join us on June the 2nd from 6 to 9PM to meet the artists and listen to the Kentucky Bootleggers. I love this cup! 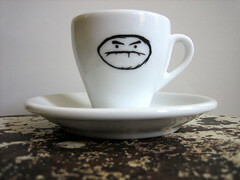 If anybody goes to NYC they need to buy me this cup and a t-shirt from Cafe Grumpy! Please, please, please!